Kalamunda Physiotherapy Centre welcomed Madeline in 2014 and she moved overseas in April 2017. Maddie is back at Kalamunda Physiotherapy Centre on a Monday and Wednesday mornings. 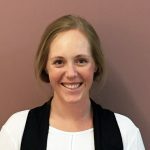 Passionate about providing quality care, Madeline uses evidence based rehabilitation techniques so you can reach your functional, lifestyle, and/or sporting goals. Maddie is excited to be back at KPC and looks forward to helping her past and future patients.